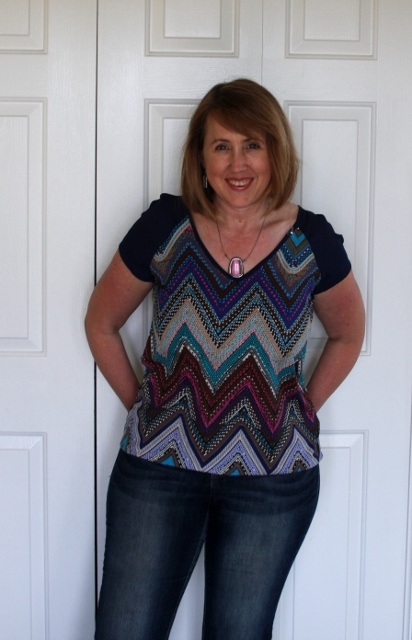 Stitch Fix time again– help? My latest fix had some things I adored, and some that seem almost right but have me still guessing. 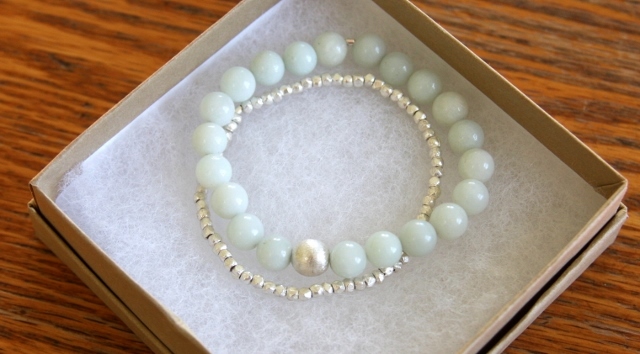 This bracelet set is absolutely lovely, but at $36 for the set, I just can’t pull the trigger. I am much more likely to hunt for jewelry at thrift stores, honestly. 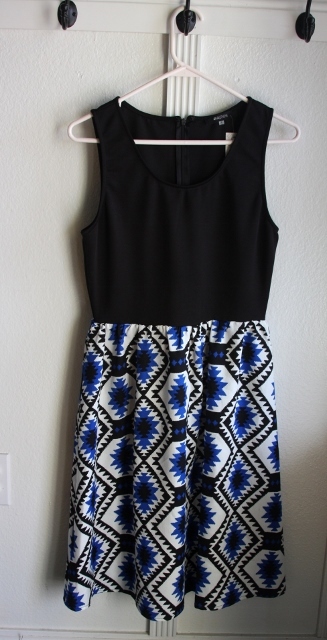 Next up is the item is this chevron print maxi skirt. I adored it the second I saw it. I have two maxi skirts already– one in navy, and one in a tiny brown pinstripe. Both are so comfy and versatile that I’ve really been wanting another. And this one is just fabulous. The pattern is flattering, I think, and I have lots of brown and turquoise in my wardrobe already with which to pair it. For sure I am keeping this. The next item is this delicately patterned white sweater. It is very lightweight and has a pretty nubby feel to it. I like the way it looks from the front, but the back has some ups and downs and some flaring that I’m not really sure about. I am pretty sure it makes me look wide in back– what gal wants that? My husband said something about a peacock’s tail when he saw it. I already have a similar sweater in cream, but it is slightly heavier weight and won’t be wearable in warmer weather, whereas this one is so light that it could easily be worn longer into warm weather. But, the back? So not sure. This next top is in a color that is very flattering to me, and most of the top is a nice stretchy fabric. But the panel in front is a woven and tugs across the chest in a less-than-great way. I want to love it, but because of that odd panel, it’s not the best fit. Also, it’s super see-through. This last top is nice considering it is a tank top. It has good coverage in back, and with another tank worn underneath, I think it is fairly modest. I like the looseness and length, and can picture wearing this at home tons in the summer. 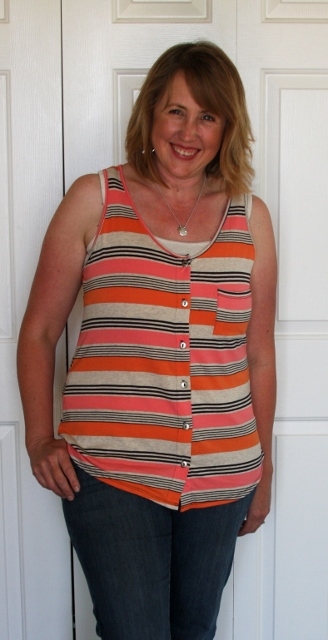 My teen daughters and I both liked the top ‘in person’, but seeing the photo of myself in it, I’m wondering if the large crosswise stripes are widening? Tempted because I think if I kept it I’d probably wear it often, but not quite sure. Also, it is $48 which seems insanely spendy for a tank, even if I am buying it with credits. I’m thinking that I will keep only one thing besides the maxi. 1. Is the tank cute enough to be the second ‘keeper’ despite the price? 2. Should I consider the lightweight white sweater instead? 3. Should I keep only the maxi? Those are the three options I’m weighing. Help? 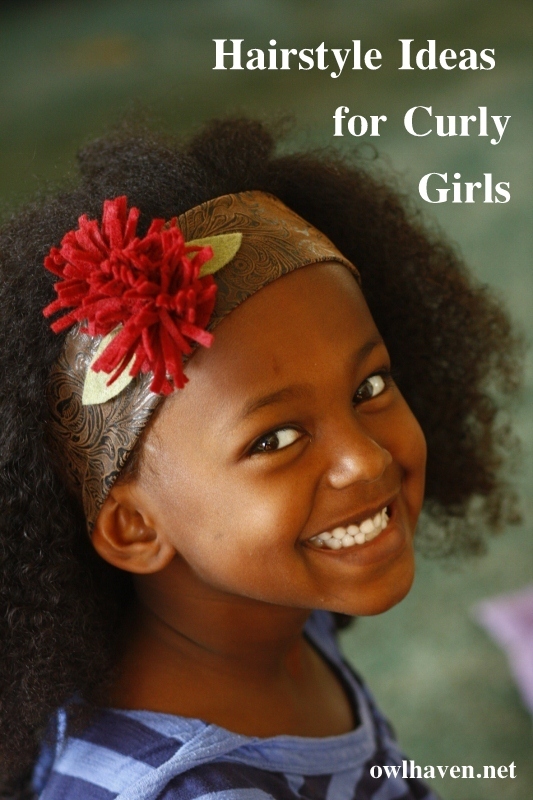 I thought it might be fun to share some photos of hairstyles our girls have had over the years. I’ve captioned each photo with a short description of the hairstyle. It’s definitely been a learning experience over the years, and some of my early attempts were a little rough. 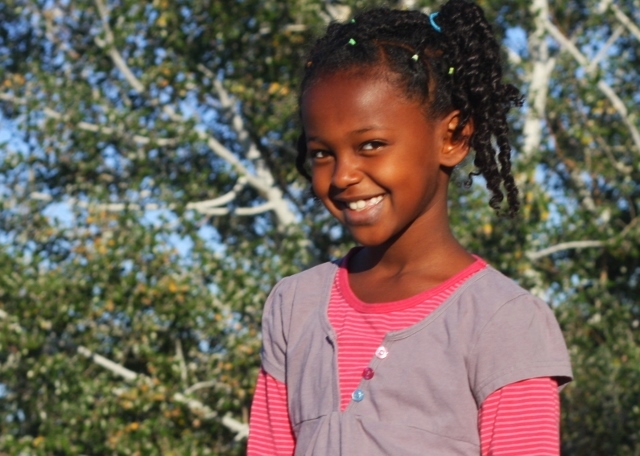 I was inexperienced, and my girls were wiggly, and had very thin hair. 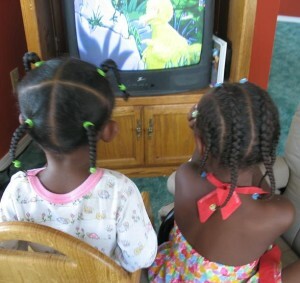 But I’ve gotten better at it over the years, and my girls are lots more tolerant of sitting still these days too. Some important tips: Make sure your kiddo has something to do while you work. We usually do movies and snacks. Make sure the hair is wet and well conditioned. Also, don’t be afraid to break up the work into sections. 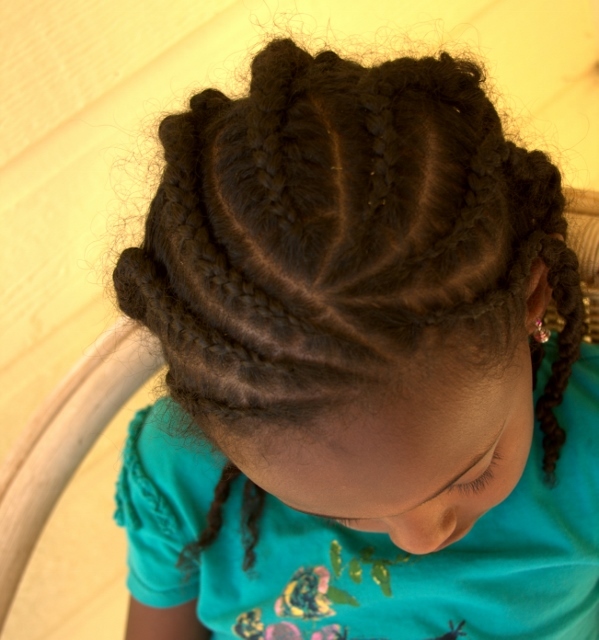 We often wash, condition and pick out the hair one day, afterward braiding it quickly into two braids, then do a more elaborate hairdo later that evening or the next day. You have to do what your child will tolerate. If this post is useful or interesting to you, I’d love a pin on pinterest! 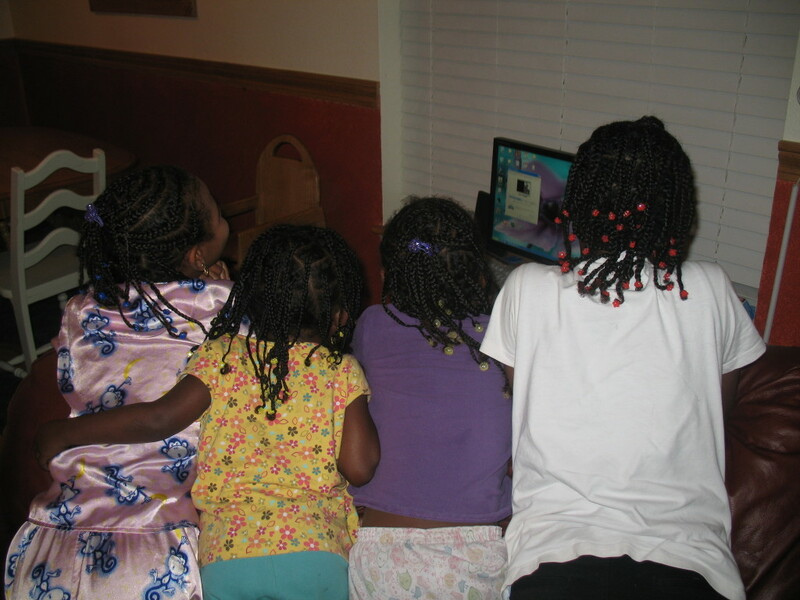 Yarn braids. 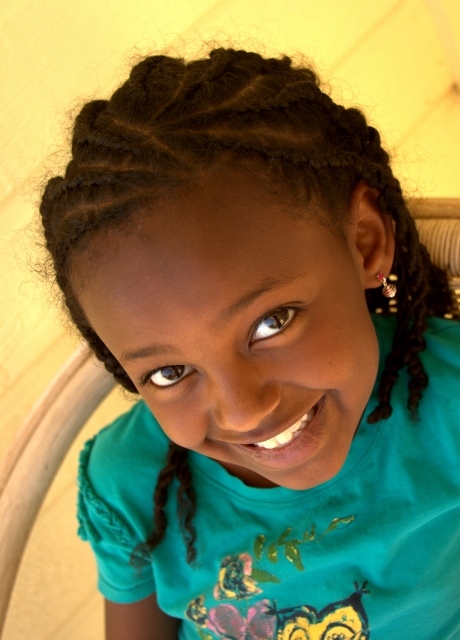 Blue – straight braids. 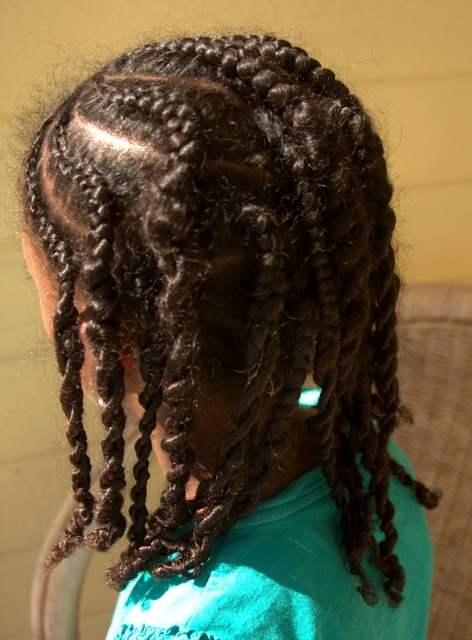 Red – cornrows. 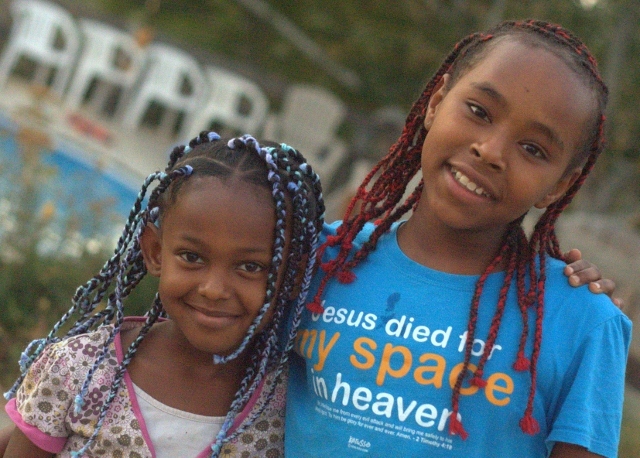 I got back very late last night from Created for Care in Atlanta. And for anyone keeping track, yes, that is THREE weekends out of town during the last five weeks– way too many. Each event was good and worth doing, but the cumulative effect of that much travel is pretty darned tiring. 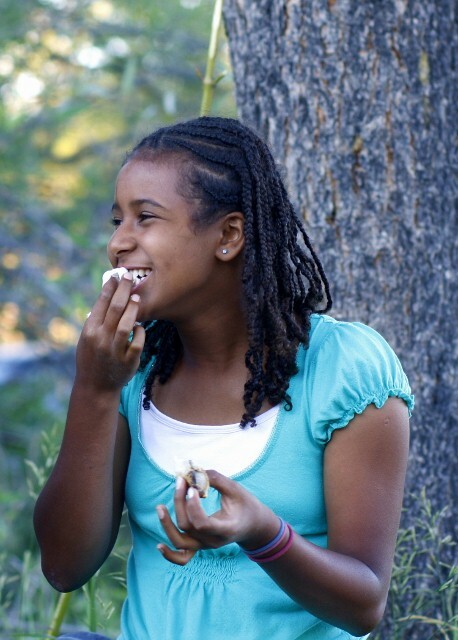 This afternoon my teens are taking a chem test, my younger girls are outside enjoying the almost- spring air, and I’m sitting here trying to decide what to cook for dinner. I think I’m feeling out of practice– certainly not in the mood anyway. What to cook??? 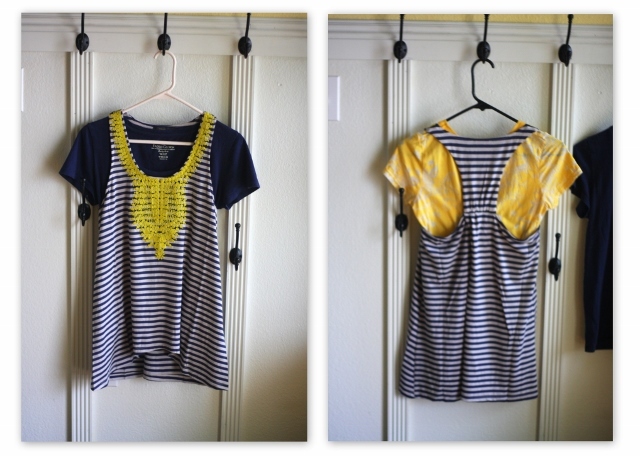 While I’m stalling on dinner, I thought I’d tell you about my latest Stitch Fix. This time around I liked several of the items that they sent me. But I’ve spent a bit much on clothing lately, so I limited myself to only two. Here are the ones that I didn’t get. The dress was a fun pattern, and a nice length, but the top was too fitted and the skirt flared out over the hips in a way that wasn’t flattering to my figure. The black top had tight cuffs at the elbow, and was my least favorite look, style-wise. It looked a bit old-ladyish to me? The lavender top was lovely and soft, and VERY tempting. I did wonder if the drapey neckline would feel like it needed constant adjustment– it had a funny little silver pendant sewn to the point of the drape to make it hang right, but I still found myself fiddling it around in the few minutes I wore it. 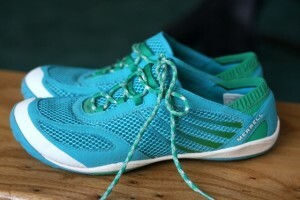 I might have kept it if it was in my budget though, because I really loved the color and the feel. Then here are the two that I decided to get. 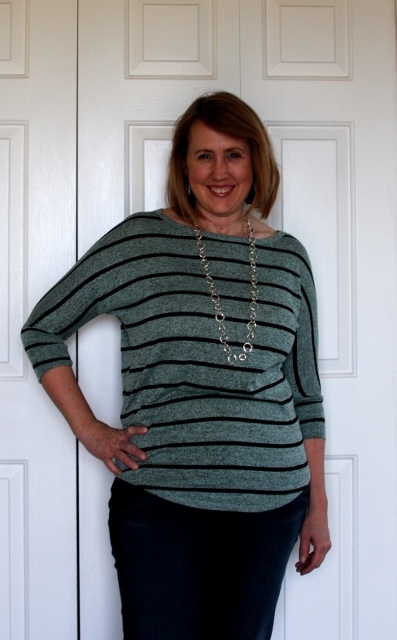 The green stripe was an easy choice– it is just really comfy and fun top, something that I could wear at home any day, but also looks nice dressed up with jewelry. 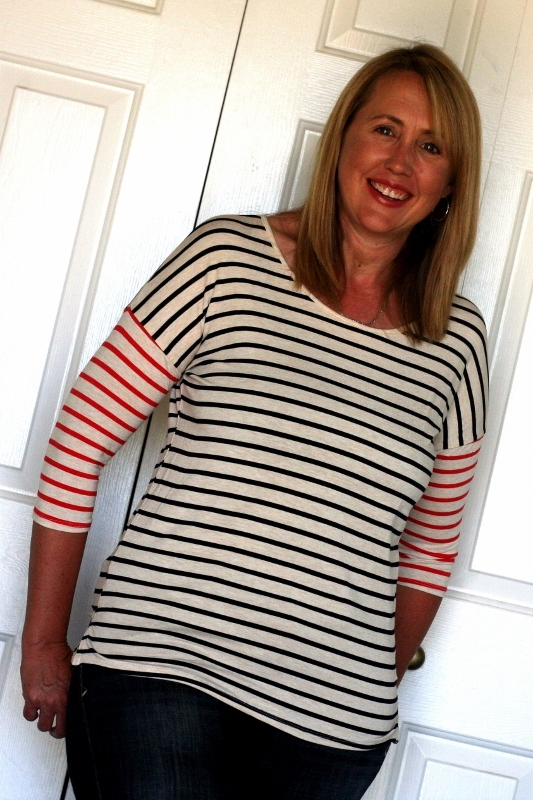 A friend of mine who also tried Stitch Fix said she got a red striped version of the same top and really likes it. 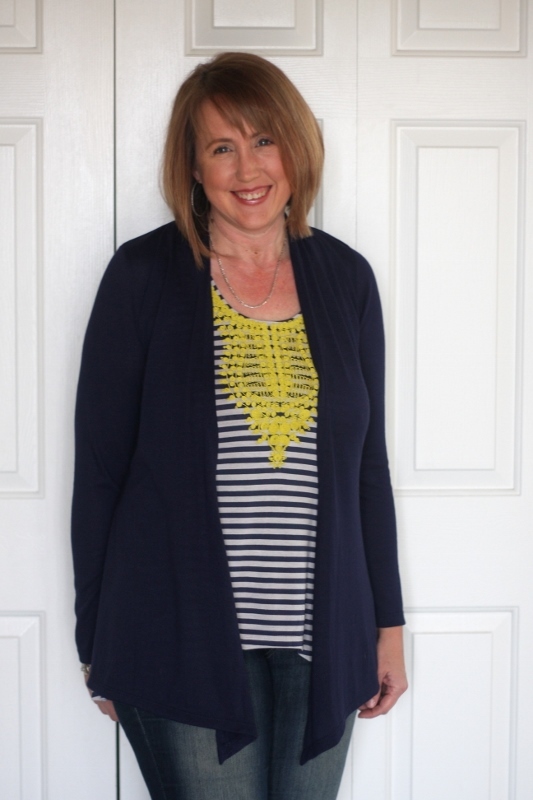 The chevron top also is comfortable, is a nice spring piece and looks good with a lot of different things I already have, including the navy cardigan that I got with my last fix. So there you have it! And now here I am, still wondering what to make for dinner…..any ideas? Just had to share a link to my husband’s post about the new bed he made for us. Didn’t he do a great job? He made the bed from walnut that he milled himself years ago. Makes our bedroom look so upscale that I hardly recognize it. Also, for any of you curious about what I picked out of my latest batch of Stitch Fix goodies, I ended up sending back the black pants and the grey sweatshirt. The pants were too spendy and the sweatshirt was just too ordinary for the price. I’d been on the fence about the striped tank top since it is bare in back and I’d only wear it under a sweater. But then I realized it looks adorable with a t-shirt underneath it. (At least I think so?) Here are a couple tee’s I tried with it that I think look cute. The navy tee especially is good because the neckline matches perfectly. It’d also be great with a plain white tee, I think. In any case, being able to wear it over a tee makes it a much more versatile piece for me. 🙂 I decided to keep it, along with both the navy cardigan and the green top. I’ve already worn all the items at least once, and I’m really happy with them. What’s new with you this week? Hope none of you are separated from family in the terrible storms in the South. 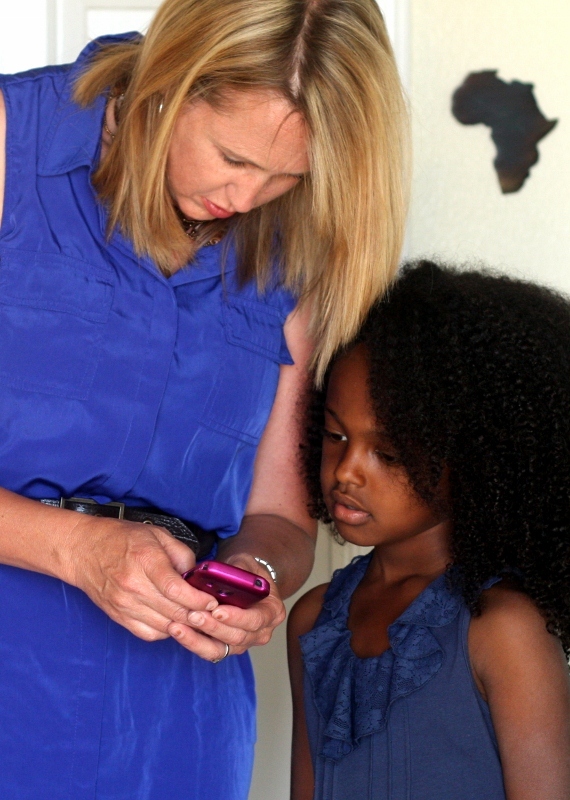 The hair, and Stitch Fix! First, as promised– the hair. I had to wash it today, and then went through all sorts of round brush/ wet hair/ blow-dryer clutziness trying to make it look like my miracle-working hair salon lady does. I was in despair for awhile. But it ended up looking somewhat similar to her results, and so I gave up for the day. I can only hope that I will eventually master the art of working a round brush and a blow dryer in tandem. Moving on to clothes. 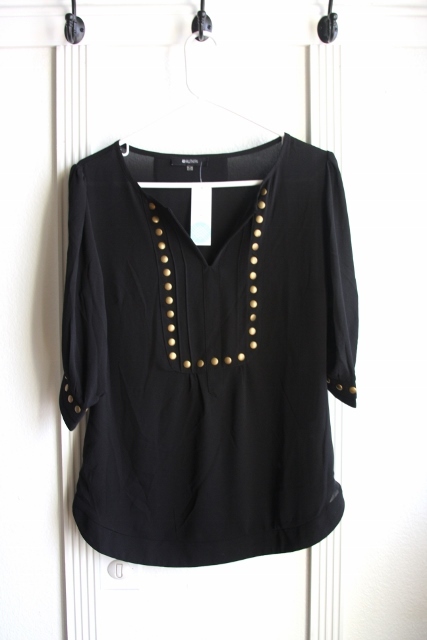 My much-awaited Stitch Fix package came in the mail today– hooray! As usual I am somewhat torn. The grey thermal shirt is the least interesting item in the box and at $48 is insanely overpriced. But it is super comfy, and has sparkles of all things– I love sparkles– and honestly, I’d probably wear it twice as often as the other dressier items, esp in the winter curled up on the couch listening to my girls read to me. 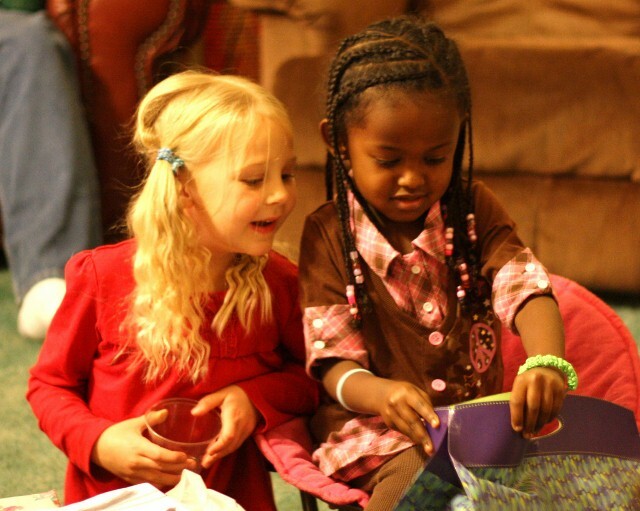 And speaking of my girls, isn’t the little girl next to me adorable? Yesterday she and I watched a documentary on Netflix called ‘Jig’ telling the story of a bunch of kids going to the world Irish step-dancing competition. So now she has decided that she might like to learn to jig. Thus the white dance-style shoes and the bright outfit. Moving on to the other items. 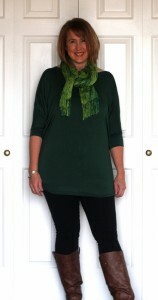 The green dolman style top looked very shapeless out of the box– it is nothing that I would even try on in the store– but it looks better on me than I expected. 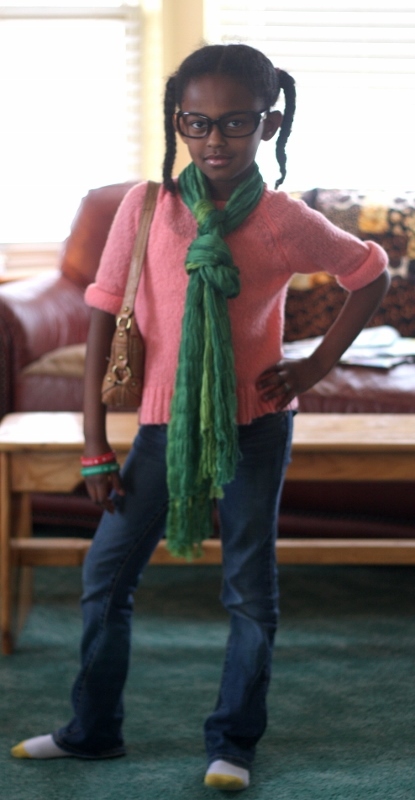 It is super soft jersey and I think looks cute with the black pants, scarf and boots. I am wondering what else it would look nice with? My jean jacket was ok…maybe a vest would be fun? The black stretchy skinny jeans also came in this fix. They are similar to another black pair I have but are bit less bulky. At $78 they are the spendiest item in this fix, but they are very comfy for skinny jeans, are fairly flattering, and high enough in the waist that I wouldn’t be constantly pulling them up. I’m tempted. Next is this navy cardigan. I have a black one that I wear a lot, and have been wishing for one of a different color. Lots of my wardrobe blends with navy, so I think I’d wear this lots, and it is a nice lightweight comfy layer. 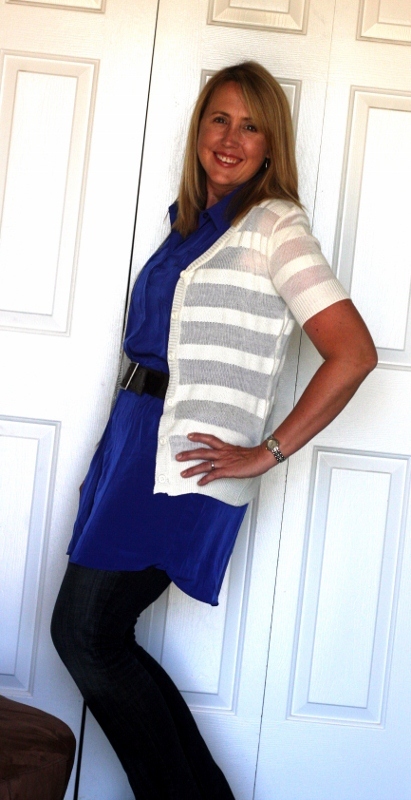 The final item is the tank that I am wearing underneath the navy cardigan. It is racerback, which means I’d only use it as an under-layer. But it is super cute with a neckline that is not too low. I love the design on the front and the way that the bottom hem is shorter in the front and longer in the back. Fun. Except a question: is the front of this top too busy for a big neckace? 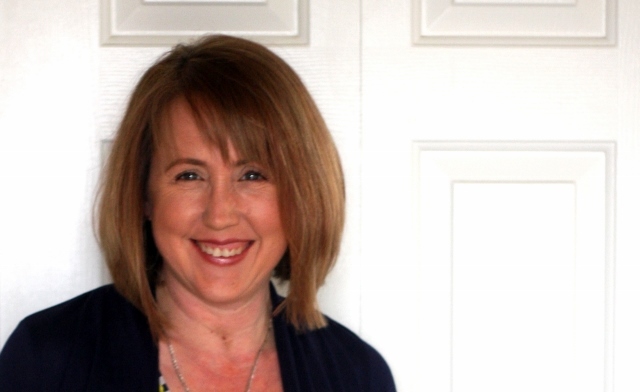 I have a blue-stone three strand necklace that fits in the neckline of the top, but when I had it on, I wondered if it was too busy with the busyness of the medallion on the front of the tank? Anyway. I really like a lot of this. The one I’d easily pass on is the grey thermal, except if you keep ALL five, there’s 25% discount, which adds up to just a dab more than the cost of the thermal. Basically, if I decide to keep four, I might as well keep the thermal too. But I’m not sure if I can justify the black pants (I have something similar) and I’m a bit on the fence about the green. It’s cute, I think. But is it too shapeless? I’d love your opinion. If you’d like a Stitch Fix delivered to YOUR door, click here, fill out the survey, and give it a whirl! Thanks for all the advice about my clothing dilemma. Your comments about the Star Trek top had me laughing. I rethought the black pants. I do love them but they are $98 and I just couldn’t pull the trigger, esp when I went to the Old Navy website and found some black jeans for $20. Not quite the same, but probably close enough. I still love the striped dress but it is $68 and I just wasn’t sure it was flattering. I may go try this much cheaper dress on at Old Navy to see if it might also have the fun vibe but be better looking on me. (smaller stripes, not flared). We’ll see. I ended up deciding on the JUST the plaid top, since I am sure it is something I will wear often, and it is soft and comfy. I have it on this second– am taking our teens to see Thor later today. The really good thing about this decision is that (thanks to some kind folks who used my referral link) I had $50 in Stitch Fix credit. The plaid top is $48, which means $0 out. My husband and our budget thank you! And thanks to everyone who weighed in. It was fun to get your feedback and it made my decision easier. I got a new Stitch Fix package in the mail today and am in need of opinions. So often I know how I feel about an item when I’m looking in the mirror, but then when I see a photo, I’m not so sure. The one item that I’m sure I’m keeping is the black high waist crop trousers that I’m wearing in three out of the four photos below. I’d been needing a versatile pair of pants to wear with boots, and tho these are styled like leggings, they’re made from a sturdy, stretchy denim-like fabric. They have a bit of tummy control, and truly look like pants at the ankle, not leggings. I think these will work with a lot of my longer tops. The plaid tunic I’m wearing in this first photo feels like something I could wear on any ordinary day, but I’m not sure I like it in the photo as much as I did in the mirror, and it feels a bit snug across the shoulders. This third item is a fun style, I think, and I like the neckline. Am thinking I might actually like my brown boots better with all the black, tho, just to break it up little. My daughter also suggested it would work well with a belt and maybe a scarf. This last dress is a little blousy and 80’s-ish, but the color is lovely, and it has pockets, which is fun. What do you think is most flattering? What looks most worth keeping? What’s Stitch Fix? Click here to order a ‘fix’ of your own. Your $20 styling fee applies toward any item you keep. Send whatever you don’t want back in a prepaid envelope. Easy peasy. For extra fun, when you sign up and refer someone, you get a $25 credit. I have a question for folks who are good at accessorizing: I got this dress on clearance at Garnet Hill for $14– hooray! The color is pretty neutral and I wasn’t sure if it would flatter my skin. But for $14 I decided to risk it and found out it’s good–it doesn’t wash me out, and the style is easy and flattering to my figure as well. But I’m terrible at accessorizing– I have no idea what to wear to make the grey a little more interesting. I wore it Sunday with silver earrings and a multi-strand silver and black glass bead necklace, which was fine, I think. But I’d love some more colorful ways to accessorize the dress. Ideas? Last week I got a fix that was a total dud–I should have shown you the items, but I just didn’t love anything enough to even make the effort to take pictures. I briefly considered one dress, but my hubby took one look at it and got a look of panic in his eyes (that ‘what the heck do I say now?’ look) and so I knew even that one would not be a keeper. It was kind of a bummer because it ate up $20 of the referral credit just to look at those items, but I still had enough credit that I decided to ask for another box. Here’s what I got this time–this batch turned out to be much more my style. Click on any of the photos to enlarge them and get a better look. 1. First up is this blue dress. It really is too short as a dress for my taste, but I loved the color against my face and it fit well. So I tweaked it around a bit to see if I could make it work as a tunic. I liked it with black leggings and black boots, except then the sleeveless part felt odd, so I put on a jean jacket, which was cute, but it totally took away the summer vibe.Hm. Next I tried it with my skinny jeans, and added a brown belt and brown jewelry, which I ended up really liking. I think I MIGHT also try it with a knee length black pencil skirt underneath, to see if that would give more coverage but still have the skirt feel. Or, ya know, lose 20 pounds so I don’t feel self-conscious about my legs. But even then I think the length is maybe too ‘young’ for me worn alone. 2. Next up is this mint cowl neck tee. It fit well, the color was good on me, and I liked the flowy motion of the style. But it had kind of an elegant-business-lady vibe (see my face trying to project that?) and I’m just not sure that’s me. Plus, the color is so pale I’d probably stain it instantly. The white shorts in the photo are already giving me fits, and I don’t really want to be fussy and worried about my clothes. 3. You can probably tell by the expression on my face that this striped top feels like me. (Makes me laugh how much my face gives away whether I like something– also, I’m so awkward in front of the camera– yikes!) Anyway, I’m not sure if in a store I’d have gravitated toward these horizontal stripes –scary! But the fabric is uber-soft, the fit is just right. and the style looks good with jeans or shorts. It just feels like something I’ll pull out of my closet to wear over and over again. Bonus– the fabric feels very sturdy, so I don’t think it will pill up as quickly as some t-shirts do these days. 4. Next up is this adorable brown print dress– I squealed when I saw it because the pattern and the flow of it is totally me! I really, really love it. Do enlarge the photos to see it better. But again, the length on this dress, though longer than the blue, made me uncertain. It came with a completely separate black under-slip, which is nice for coverage, especially because the skirt is very light and flippy. I can totally see myself wearing it out on a date with my hubby, but at church I’m afraid I’d be tugging it down and feeling self-conscious. So again, I tried it tunic-style with my skinny jeans. I’m not sure if that truly looks OK. Is it too long and too flippy to pretend to be a tunic? 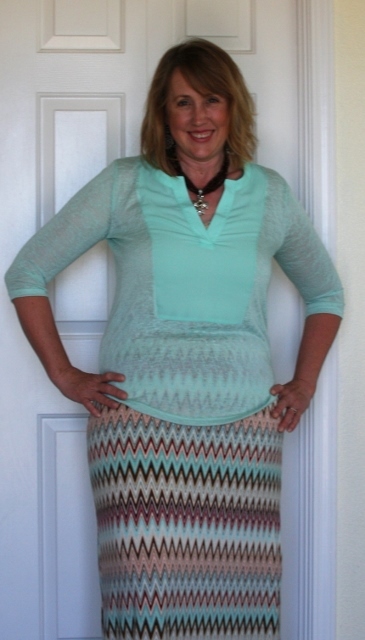 And is the crossways pattern on the skirt flattering to my hips? These are the questions I’m asking myself. I really, really love the pattern, and really want to make the dress work, but I’m just not sure. What do you think? I’m seriously thinking about keeping it for my 17yo daughter. The colors would be gorgeous on her, I could still admire the dress 🙂 , and she’s 5 inches shorter than I am, so the length would be perfect on her. 5. Finally, they sent me this adorable short sleeve white sweater. My 8yo took the picture, and I could see her lowering the camera about to cut off my head– thus my funny knee-bend pose. 🙂 This type of layer would be useful for a TON of different outfits– I’ve been needing something along these lines for awhile. It fits great, and is a nice sheer layer– so much fun. So what do you think? Which looks best on me? If you think you’d like to try Stitch Fix for yourself, click here. If you order a fix, a referral credit will go to me– thanks!! And if you recommend Stitch Fix to your friends, you can get credit as well. So whaddaya think? What should I keep? I’ve been a fitness loser lately. Well, maybe not a complete loser. I have been getting out for a couple little sauntering walk/runs per week for a grand total of 4 or 5 miles a week. But I’ve definitely lost the eye of the tiger. (Do people use that phrase outside of a Rockie movie? I don’t even know.) And even worse — it pains me greatly to say this– I’ve gained back 7 pounds of the 20 I lost a couple years ago. This will not do, folks. I worked way too hard to backslide any more. On it I’ve listed various healthy habits I’m aiming to practice each day: tracking my food, having a a salad-meal a day, only having fruit for evening snacks, running or walking a mile (or two or three) a day, and lifting weights now and then. Each item earns a point. My personal goal is to have 120 points by the end of the month. Just a way to keep myself remembering to fit in the things that help my be successful fitness-wise, you know? Today I did 3 miles on the elliptical, had a salad for lunch, ate strawberries for a bedtime snack, and lifted weights for 10 minutes. So that’s a total of 6 points today. That’s better than I’ve done in awhile. How about you? Need some motivation toward fitness? Does a challenge along these lines sound like fun? If so, print off a copy of my fitness chart and join me! I’ll check back in at the end of the month and tell you how I’ve done, and if you want, you can tell me too!